After players departed for the showers, students sulked back to their dormitories and the grounds crew collected the equipment, Quinnipiac men’s lacrosse head coach Eric Fekete sat on the bench with his eyes closed and head in his hands. Quinnipiac men’s lacrosse’s effort to give Metro Atlantic Athletic Conference rival Marist its first conference loss of the season came up short, as the Red Foxes (6-3, 3-0 in MAAC) bested the Bobcats (2-6, 1-2 in MAAC) 17-10 on a snowy Saturday at the QU Turf Field in Hamden. For the third consecutive game, Quinnipiac elected to start senior goaltender Colin Nesdale in net. Nesdale helped snap Quinnipiac’s four-game losing streak against Detroit last Saturday, compiling 11 saves on 23 shots. Saturday, though, Nesdale’s day was cut short after allowing six goals on seven shots in just over one quarter of play. Fekete replaced Nesdale with Jack Brust. Following an unassisted wrist-shot goal in the back of the net by Michael Sagl, who extended his point streak to 40 games, the Red Foxes took control and never looked back. Marist tallied nine goals in the second quarter, including an 8-0 run to end the first half to give them a 14-5 lead over Quinnipiac. For the second quarter, Marist won 11-of-12 faceoffs and finished 25-for-31 for the game. Grabbing ground balls was also difficult for Quinnipiac, which picked up 6-of-25 loose balls in the second quarter, going 27-for-67 in the game. In the second half, the Bobcats outscored Marist 5-3. 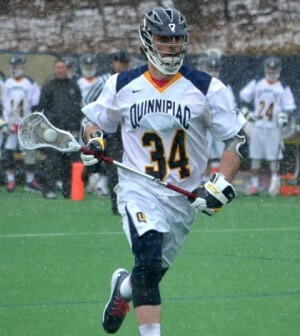 Quinnipiac’s Ryan Keenan notched four goals and finished with five points for the second consecutive game. Coach Fekete said his team executed his game plan in the first quarter and entire second half. Marist capitalized on the man up possession three times on five Quinnipiac penalties and forced 11 turnovers. Despite the loss, Coach Fekete said his team will recover if it limits its mishaps. Quinnipiac wraps up the month of March with a visit to Stony Brook (6-2, 1-1 in MAAC) on Tuesday.